Labyrinthaki Cave is located on a small hill between the villages of Plouti and Moroni, about 50 km south of Heraklion. Actually, it is not a classic cave in the literal meaning of the word but the remains of an ancient quarry. To get here, after leaving Zaros, head towards Moroni. Then, passing through this place, continue on Plouti. After leaving the village a bit over a kilometer more or less halfway to Plouti, turn right. The road will lead us through the cultivated fields towards a fairly steep hill. After entering the entrance to Labyrinthaki it is already visible. The next path turns into a scooter. The car can be left on a small square by the road. The cave leads a fairly wide and low entrance, which you have to climb a bit. Immediately after crossing the threshold of the cave, we are in a large hall about the size of 300 square meters and a height of about 4 meters. Several powerful rock columns support the vault. Nevertheless, the whole "structure" does not look too sure and seems to threaten to collapse. Superficial viewing of this place does not require any additional equipment, but if you want to look a little deeper, you should have at least a flashlight. Of course, you enter such places on your own responsibility and therefore you have to take care of your own safety. The name (Μικρή Λαβύρινθος - Mały Labyrinth) refers to the much larger cave in the neighborhood, simply called the Labyrinth (Cave Labyrinth). 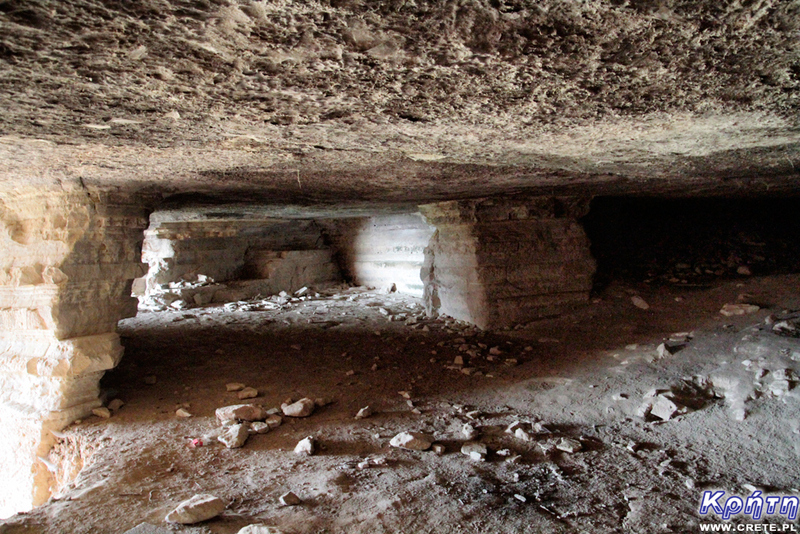 Although both caves are located nearby, they are not connected to each other. Common to them is that in both places in ancient times mined stone was used to build a nearby Minoan palace in Phaistos, the buildings of the villa in Agia Triada and Gortyna, or the former capital of Crete. This second cave, or rather a quarry, is much larger and its intriguing history has been remembered for some time. Located in the northern part of Messara at an altitude of 413 meters above sea level, it has a total area of ​​nearly 9,000. m. Speleologists will determine the length of its corridors over 2.5 km. Currently, however, there is not much left of its original shape. During World War II, it was almost completely destroyed by the retreating German army. Nowadays, the remains of underground corridors aroused the interest of many researchers, who recognized that this place, and not so far thought Knossos, perhaps should be considered a mythical labyrinth of the Minotaur. Of course, the term labyrinth is purely arbitrary, but this association is necessary when viewing for the first time innumerable underground corridors. This cave was formerly referred to as the Labyrinth by the first travelers visiting Crete in the early 20th century. At that time, it was one of the places willingly visited in Crete. Confirmation of this can be found in historical books describing these journeys. Only after the Knossos palace was brought to light and Evans pointed out this place as the Minotaur's mythical labyrinth, the significance of this cave began to decrease systematically. Today we still can not be sure how it was with the mythical Minotaur. The most probable, however, is that in ancient times, slaves mining stone building were working here. Later, after closing the quarries, the place is inhabited by bats. Their droppings were collected by local residents who used them to fertilize their fields. During World War II, Labyrinthos was occupied by Germany and after adapting it to their needs, they used former quarries to store water, food and as a huge ammunition warehouse. According to the researchers, 300,000 tons of various types of weapons and military equipment were stored here. On October 15, 1944, the retreating occupiers blasted the ammunition accumulated here. As a result of a huge explosion, the system of underground corridors has been largely destroyed. The strength of detonation should be demonstrated by the fact that 15-ton boulders were thrown outne of this cave were found 10 km away. The explosion, however, did not destroy all the ammunition accumulated in this place. After the war, many local residents made attempts to extract the remaining cargo. Unfortunately, many of them lost their lives here. In the 1950s, a Greek company acting on behalf of the government took care of cleansing the Labyrinth. The dates engraved in fresh cement also show that a number of works were carried out at the time to strengthen the walls. Unfortunately, due to financial disagreements, however, these works have never been completed. However, the war ammunition that still remained in this area still attracted people seeking weapons. On April 11, 1961, a major explosion occurred, resulting in the deaths of four people. After this accident the army secured the entrance and the entrance to the cave was strictly forbidden. For 20 consecutive years, no one managed to get inside, while the cave itself began to fall into human oblivion. According to scientists who have been investigating it today, today it is the most forgotten place in Crete, which is not mentioned by any guides. It was not until 1981 that a group of Greek speleologists dug a new hole through which they got inside the Labyrinth. In the following years, more groups of speleologists appeared here and new entrances were created. Thanks to these researchers, modern maps of this place were created, reports were developed and a number of tests were also carried out. To this day no one knows exactly how many ammunitions are still in the remains of the labyrinth corridors. Certainly there are various chemical processes and corrosion affecting dangerously to its condition and general safety of the entire hill. There are indications that the outbreak of 1961 could destabilize the entire hill, inside which there is a cave. If you have now stated that you will add the Labyrinth to your holiday plans, we have a bad news for you. It is one of those places on Crete, which you will not see. Only few speleologists and researchers have access here. For the rest, the cave is still unavailable, and the entry is strictly forbidden due to the threat. In 2010, the Prefecture of Heraklion issued a press release about the re-closing of this place and the data on the exact location of the cave are removed for security reasons and so as not to tempt the curious. The area around the Maze was fenced and provided with appropriate information boards, which the locals love to shoot. In 2010, the German company Tauber submitted a proposal to perform further part of the cleaning work carried out in the labyrinth. Unfortunately, however, they never came to fruition. In addition, the words spoken in July 2014 by the Greek Minister of Culture Nikos Xidakis ("forget about the Labyrinth") leave no illusions as to whether a tourist attraction will be created there once. The instability of the land and the excessive distance from the main leisure areas make it impossible and exclude the sense of adapting this place to safe sightseeing. There is nothing else to do but to delve into the studies made by contemporary researchers who have learned this place well. It is worth mentioning, for example, Thomas M. Waldmann, who collected the results of research on this place on his website: http://www.labyrinthos.ch/Labyrinth-Hoehle.english.html . You can also go to Labirynthaki, a small neighbor of Labirynthu, from the description of which we started this story. 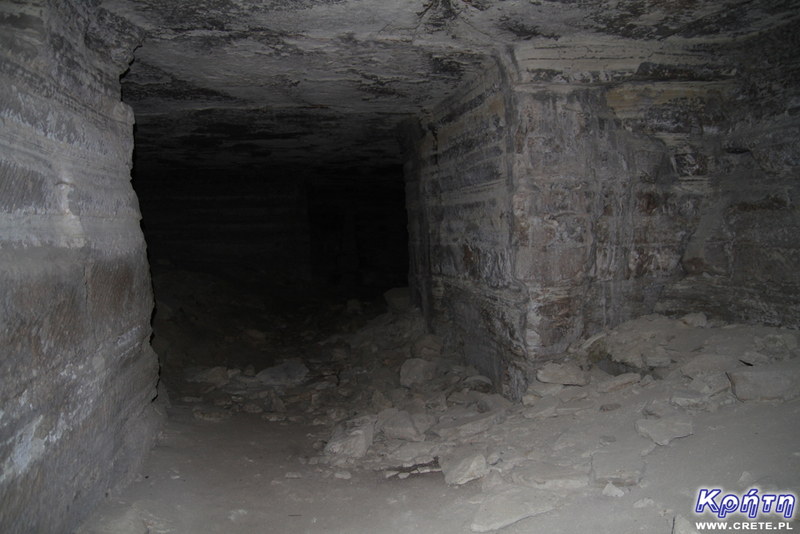 Due to the fact that admission to the big Labyrinth quarry is forbidden and it is a very dangerous place, the pictures illustrating this article were made only in Labyrinthaki.